Mike, Garret, and I had a trip on Easter morning. Water was up as usual and buggers were the name of the game. With the picture above is Mike with the lady landing a big rainbow on a large streamer. 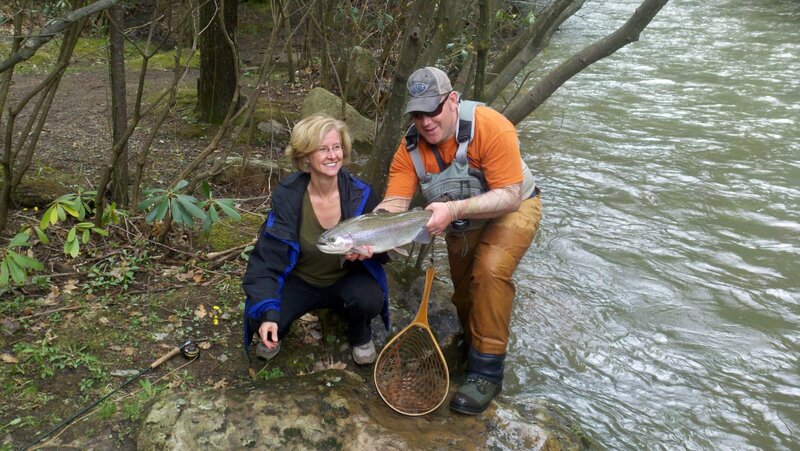 I had got a Tiger Trout there on an earlier trip, but couldn't get this big boy to eat. It was a great way to end the trip. In the picture below are my parents labs. 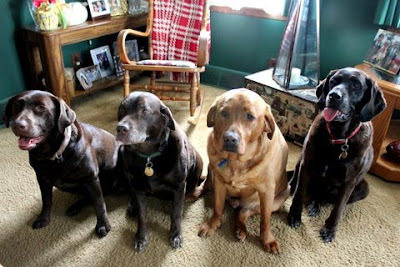 I must say, this is a hard picture to take with four labs to look at the camera at the same time. I thought Mom and Dad did a good job with the picture. Tucker, a Fox Red lab that was rescued this winter is really fitting into the family. Abby, my sisters chocolate lab is the ornery of the bunch. Maggie was my lab while growing up and has set the standard for our type of family pet. Bailei, which was hit by a car a few years back, is the most affectionate of them all. There is no better feeling than stopping by my parents house for good food and seeing the dogs. What I would give to land a trout that size. Congrats on a super catch.